Charles Arthur Russell, Baron Russell of Killowen, GCMG, PC, QC, DL was an Irish statesman of the 19th century, and Lord Chief Justice of England. He lived at Tadworth Court from the time he acquired the property in 1885 until his death in 1900. The property is now home to Children’s Trust in Tadworth. He routinely arranged for Mass to be said for his family and staff whenever he was in residence. He was succeeded by the Baron Russell, who continued to maintain a chapel there until he and his widowed mother moved to the estate at Lane End, Chuck’s Lane in Walton on-the-Hill in 1910. There he built an oratory dedicated to St Charles Borromeo where Mass was said from 1914 onwards. Jesuit priests from Farm Street would come down from London to celebrate these Masses. In 1953 a new arrangement was made and the chapel came into the Epsom deanery as a chapel-of-ease served by clergy from St. Joseph’s Parish, Epsom. Canon Robert Christall, the parish priest at the time was assiduous in developing the small centre and during the 50s money was collected with the idea that, one day, a proper church would be built to replace the private chapel. Mr. John Heagerty had been educated at St Edmund’s College, Ware, and joined the Royal Flying Corps during the Great War (1914-1918). He had the dubious distinction of being shot down in combat by the legendary German Ace, Baron von Richtofen, better known as the ‘Red Baron’. He was badly injured, but survived coming to see this as an impulse to think deeply about his Catholic faith and to pursue what became his dream to have a local church ‘with playing children and praying nuns.’ In time John Heagerty, acquired and donated to the Church the present site of King’s Lodge and its grounds for use as a future church, convent and preparatory school. His friend, John Graham supported him in the endeavour providing some of the original financing. Their vision was fulfilled of having ‘children playing but there would be no ‘nuns praying’. There would be no permanent convent. With King’s Lodge and grounds acquired, Fr John Chatterton, parish priest of Epsom worked with John Heagerty in the preparatory planning work for the new Tadworth church. In preparing for the opening of a school, the Sacred Heart nuns at Epsom were invited to start a mixed preparatory school alongside the house. Initially the house itself was extended to provide two classrooms, and the first Mass was said there on Sunday, 9th March, 1958. In 1958, the nuns built a hall on the site of King’s Lodge and opened a nursery and junior school. They also planned to build a convent on the site but this plan was eventually abandoned, being overtaken by the building of the convent at Epsom in 1974/75. The land at Tadworth was then sold by the nuns for building development. Despite this setback to John Heagerty’s dream, the idea of a church itself was very much to the fore. From March 1958, the old big house on the site of King’s Lodge was used for Mass. Records show that up to 200 people would attend on Sundays. Tadworth continued to be served from St. Joseph’s Parish Epsom until February 1960 when Fr Edmund (Ed) O’Shea from John Fisher School, Purley became Priest in Charge on a temporary basis.) Fr John Proctor succeeded him of the newly establish Tadworth Parish. It was only in 1961 that the real work to build a church was got under way. 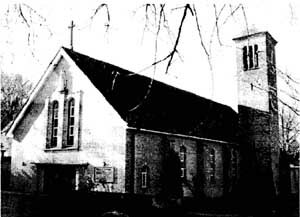 By 1961 the new parish was ready to commission an architect to draw up a design for the church. The finance was largely there thanks to major donations from John Heagerty and John Graham. In addition, funds had been raised through the years from the Russell chapel masses. The first architect was Sir Philip Goodhart-Rendel. He was President of the Royal Institute of British Architects. Twenty-five years before he had designed Prinknash Abbey. However, the advent of the First World War meant a long delay in completion. In the end a very much slimmed-down version of the original plan was adopted and another architect brought the project to completion. By coincidence the same scenario played out also at Tadworth when, several other architects having been tried, the parish, like Prinknash turned to Mr. Frank Broadbent of Broadbent & Partners, Manchester to take over the project in Tadworth as well. Planning permission for the building of a new church came in May 1964. It was decided that the building ‘should not be wholly traditional nor yet ultra-modern’ The exterior would therefore be traditional but the interior should show a more modern aspect in its detail. Like the planning stage the building stage had its problems, disputes and difficulties. Many alterations were made to each design that came forward, often on grounds of cost. The chosen builder was Adams Bros. who was regularly asked to lower the price. Despite such requests the cost always remained over £50,000 however hard they tried! To complicate matters over this period, the entire Catholic Church was in upheaval as the Second Vatican Council (1962-1965) took place ushering in many liturgical and other changes. Tadworth also found itself in a new diocese and of course fresh diocesan approval had to be obtained to build a new church. The Diocese of Arundel & Brighton was formed on 28 May 1965 splitting off from the Diocese of Southwark. The new bishop, Bishop David Cashman, duly gave his approval and work on the site finally commenced on 25 January 1965. Progress was slow, bad weather intervened and at least one foreman had to be replaced. And then the foundations were problematical: the sub-soil consisted of chalk, clay and sand, and test bore holes showed that chalk was much further down than had been expected. It was necessary to go down 14 feet throughout the whole of the footings. Shortly after this a further difficult problem arose with regard to the water drainage from the convent owned property nearby. All these problems were overcome and the work progressed. Rightly, it was Fr Proctor who laid the last brick — topping out the tower. The furnishings in the church were almost all carried out by Vanpoulles of Vauxhall Bridge Road, London. The congregation generously donated to the fund for these furnishings. Individual parishioners were generous in giving particular items such as altar cloths, Stations of the Cross, ciboria, a credence table, sanctuary lamp and other such items. The evocative statue of St John the Evangelist high on main entrance front facing wall was the work of Mr. Michael Clark, P.R.B.S.. One of his concerns was to try to make the head and shoulders pigeon-proof. Generous contributions to the cost of this statue were made by members of the parish, the Catholic Women’s League and the Heagerty Trust. Who Chose the name? There seems to be no record of how the name of St John the Evangelist came to be chosen for the new church. In much of the correspondence that still exists in the archives the headings of letters vary from “Tadworth,” “King’s Lodge,” “New church,” “Proposed new Church” to no heading at all. Suddenly from the letter to Fr Proctor in September 1963 from an architect (not the one chosen) there appears the heading “Church of St John the Evangelist, Tadworth, Surrey.”, The son of Zebedee, it may be remembered, was by tradition the author of the fourth Gospel. It was Irenaeus in 180 A.D. who gives the first explicit testimony when he wrote “Last of all John, too, the disciple of the Lord who leant against his breast, himself brought out a gospel while he was in Ephesus.” A likely explanation for the naming of the church is that so many who bore the name of John had been involved in bringing the Gospel to Tadworth that St. John the Evangelist was considered appropriate. It was Fr. Proctor who saw the completion of the work. On Friday 14” October 1966 Bishop David Cashman, the new bishop of Arundel & Brighton, celebrated Pontifical High Mass in the new Church and solemnly blessed the Church. During the ceremony John Heagerty and John Graham were granted special papal honours both becoming Knights Commander of the Pontifical Equestrian Order of St. Gregory the Great (K.C.S.G. ), ‘for their outstanding generosity’. Sadly, Fr Proctor, who had been such an important part of the whole project, fell ill soon after the new church had been blessed. In 1967 he had a coronary thrombosis, felt to be the result of the strain of his efforts during the previous seven years. He retired to the chaplaincy of Sion Convent in Findon, where he died two years later on 15 February, 1970. He was replaced in January 1968 by Canon Daniel Moriarty who before his appointment to Tadworth, had earlier as Dean of Epsom, blessed and laid the foundation stone of the new church on 26th June 1965. Canon Dan, as he was known quickly set about building the presbytery next to the church incurring some debt. The church too still had to be paid for. However, the substantial funds that were available went a long way towards full payment for the church and presbytery but until the debt was cleared the church could only be blessed but not consecrated. Canon Dan was a legendary fund-raiser and the final portion of the debt of £12,000 was paid off in 1978. It now became possible for the church to be consecrated. On 10 May 1978 the newly appointed Bishop Cormac Murphy O’Connor celebrated the Solemn Consecration of the church in the presence of a large congregation. During this time the hall was built. It wasn’t long after this (May 1981) that Canon Moriarty celebrated his golden jubilee of ordination at St John’s. The Caterpillar’s nursery school alongside the Church Hall today is a commercial venture run as a business completely independent of the parish. It was leased by the diocese in 2014. Prior to that it had opened in 1958 by the Sacred Heart nuns from Epsom initially in the King’s Lodge site. It took children up to the age of 11. The sisters had originally I intended to build a school and a convent on the site but this never came to fruition. However, they continued to occupy the old house until 1973 when they handed the school over to the diocese. The following year the older children transferred to St. Anne’s Catholic Primary School in Banstead leaving the Tadworth site as a nursery school only. Following the demolition of the house the nursery school transferred to new classrooms purpose built on the present site. The parish ran the St. John’s Nursery School until 2014 when it was transferred to its present commercial status. Monsignor William Westlake followed Canon Dan as parish priest in1981 during which times the parish saw considerable growth and development. The old house ‘King’s Lodge’ was finally demolished in 1979 with part of the land attached being sold for development of what is now known as ‘King’s Court’. Sufficient land was retained for the building of a church hall. This was duly built and opened and blessed by the then bishop, Bishop Cormac Murphy O’Connor in May 1982. It is curious that that the church was designed with a bell tower but not provided with bells! In 1989 Mr. Matthew Haddad noticed this omission and generously donated funds to pay for the installation of a bell controlled by an electrical mechanism allowing several types of peal on a timer. Mgr. Westlake retired in 1995 due to poor health and Fr. Gerald Vann became parish priest. He was reappointed in 2001 and for a time no priest could be found to lead the parish. It was in 2001 that Fr. Ken McCarthy accepted the role of Priest in Charge holding the fort till 2002 when Fr. Martin Breen was appointed parish priest in 2002. A renowned golfer Fr Martin was hugely popular both within the parish and in the local community. He worked tirelessly to make the children of the parish central to the future of the parish. It was during Fr. Martin’s tenure that parishioner Maria Eckett donated a sum to fund the creation of a window in the wall behind the altar in memory of her husband Fred. The window known as the ‘Rose Window’, was designed by Andrew Taylor of Devizes and depicts a seated St. John, inspired by a painting of El Greco. It includes a bull terrier, a dog kept by the Eckett, in memory of the donors. Fr. Martin’s death in 2015 was sad loss to the parish family. Once again no priest could be found when Fr. Martin died. Fr. Anthony Hale, a retired Passionist priest, working with the diocese generously stepped in and ensured that Mass and the sacraments continued to be celebrated. During this time Mrs. Margaret Tickner together with the Parish Finance Committee managed the day to day business of the parish until a new priest was appointed in October 2016. It was with great joy and thanksgiving that the parish celebrated 50 years since the opening of the church. Bishop Richard Moth presided in a packed church at a special Mass of Thanksgiving on Sunday 16 October 2016. Mgr. Richard Madders was formally inducted as parish priest on 24 January 2017.